Seas the Day! 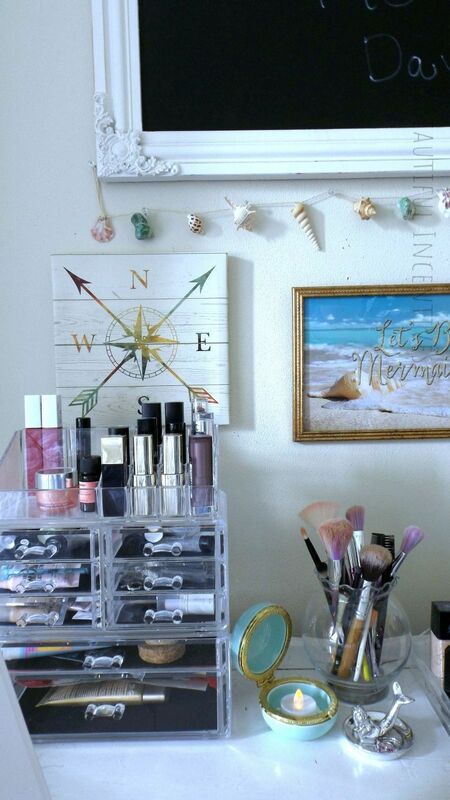 I have been wanting to do a beachy mermaid theme for my vanity for a while now, but I had to do so on a low budget. Thanks to Dollar Tree and the things I had in storage from other places, such as Micheal's, eBay, Amazon and World Market, I was able to bring my idea to life. I absolutely love how it turned out! Most of what you see here is from Dollar Tree. A lot of which, I purchased recently, so you can probably still grab many of the things and even online. They have free ship to store and just recently started to offer smaller units of 4-12! They are meeting the demands of their budget consumers! Make sure to check out the end to easily Shop this Post! The idea was to really hone in on the whimsical mermaid aspect of the beachy theme. There was no shortage of items to make that happen. This was such a gem to find. It is a small stretched canvas with a faux wood print. Very nice quality for something that was only a dollar! I used the tiny seashells from a necklace I had to decorate the candle stick holder. I already had e-6000 on hand, so the whole project cost me $1! Just glued them on 1 by 1. A lil time consuming, but worth it for that elegant beach side look! 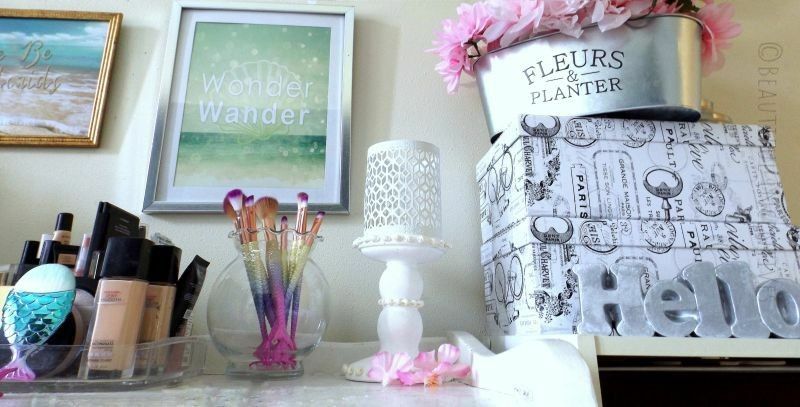 The candle holder on top is always from Dollar Tree and this whole set up would be perfect to hold anything from cotton swabs to craft items or just a candle. Get creative! 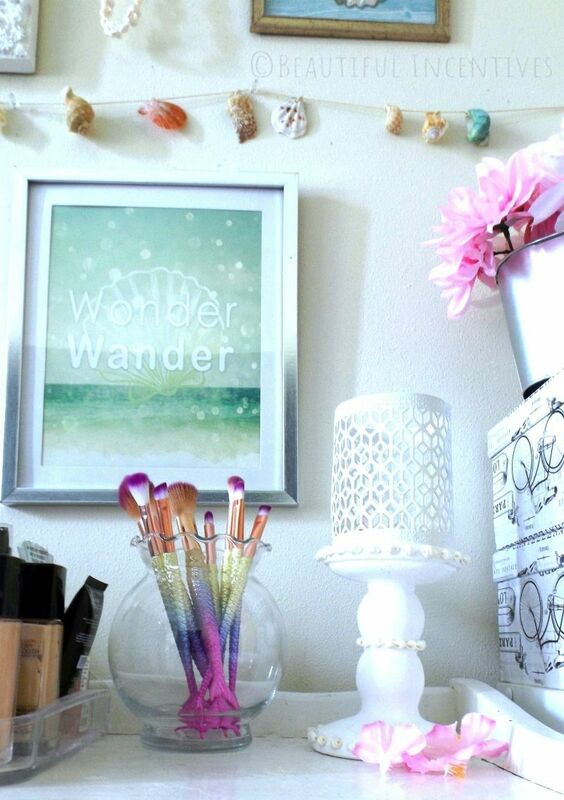 I really adore the Wonder Wander art as well, but the frame it came with wasn't so decor friendly. So instead of painting it, I bought a different frame at the Dollar tree. The silver is so pretty and thick. The pic and the frame quality together look like something you'd get for much more money! The turquoise slash mint macaroon case resembles a clam enough and it really fit the color scheme. I added a lil dollar tree tealight to make a cute lil candle holder. (They also have color changing ones!) Next to it is another dollar tree purchase, the silver mermaid ring holder. Really cute! Behind it is 1 of two fish bowl vases that I thought went perfectly with the ocean theme to use as brush holders. 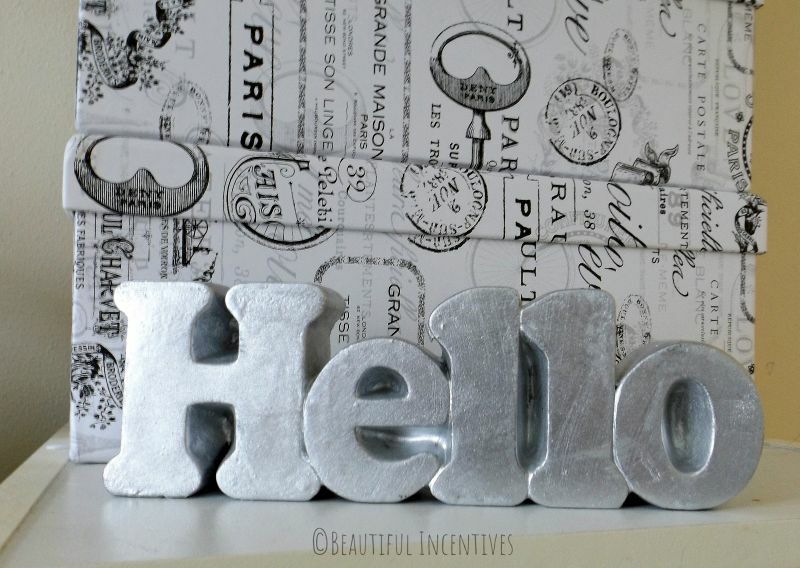 This silver metal "Hello" sign is a cute and welcoming touch. It is heavyweight and i'm shocked it was just $1 from Dollar Tree! It would make a great paperweight as well. Above this, is a shabby chic metal garden tin and faux roses also from, can you guess? Yup, the Dollar Tree. 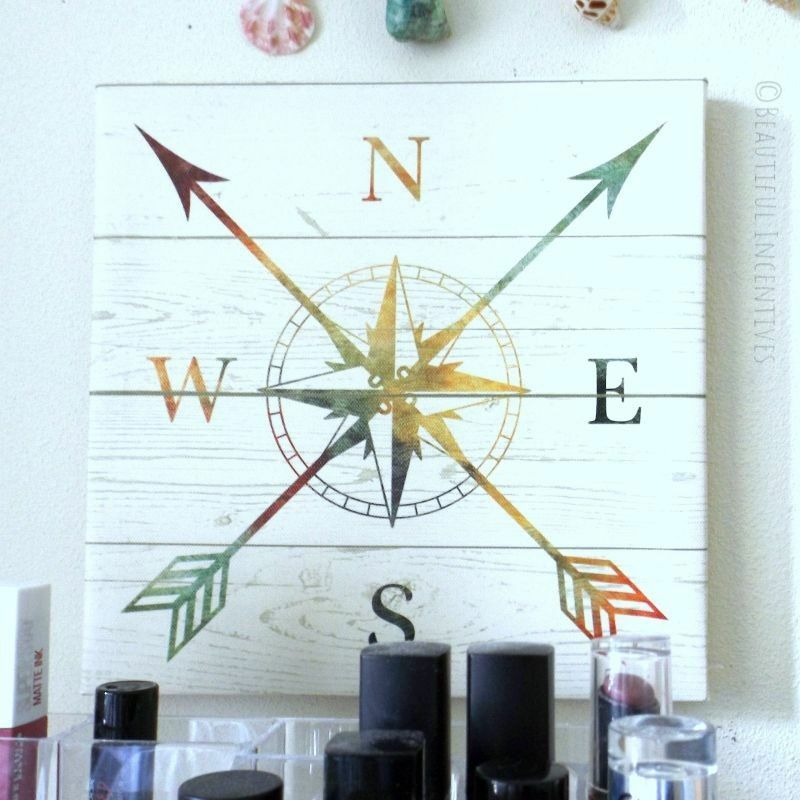 Something you can easily find for more at a craft store! All the framed pics are gorgeous and I was yet again, so surprised to find them at the Dollar Tree. I even liked the frame colors enough to skip spray painting them. I think the variation of distressed frame colors really makes it a unique setup. The entrance into the boudoir also has a beautiful wooden lighthouse sign. It has a shabby chic distressed look and makes for such a welcoming feel. Posts may contain affiliate links, which will earn me a small commission through your purchase. Thanks so much for your help. Metal wall mount sea blue mermaid hook - Very heavy duty and easy to mount. Adjustable trifold magnifying 22 led light mirror- I've been through 3 and I love this one. Mermaid makeup brushes- Best quality I've found for the price and quantity. 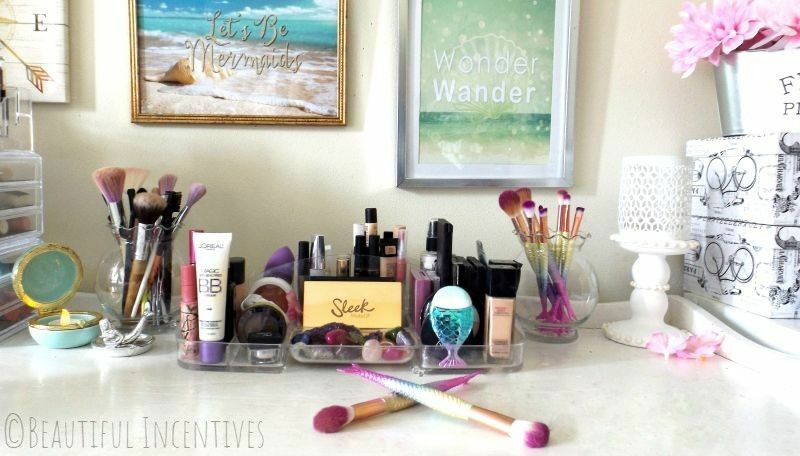 Large acrylic makeup holder with drawers-This holds so much! Perfect for crafts too. Large Georgina Ornate Chalkboard - Beautifully crafted and lots of space to write. Much more Dollar Tree items in store! 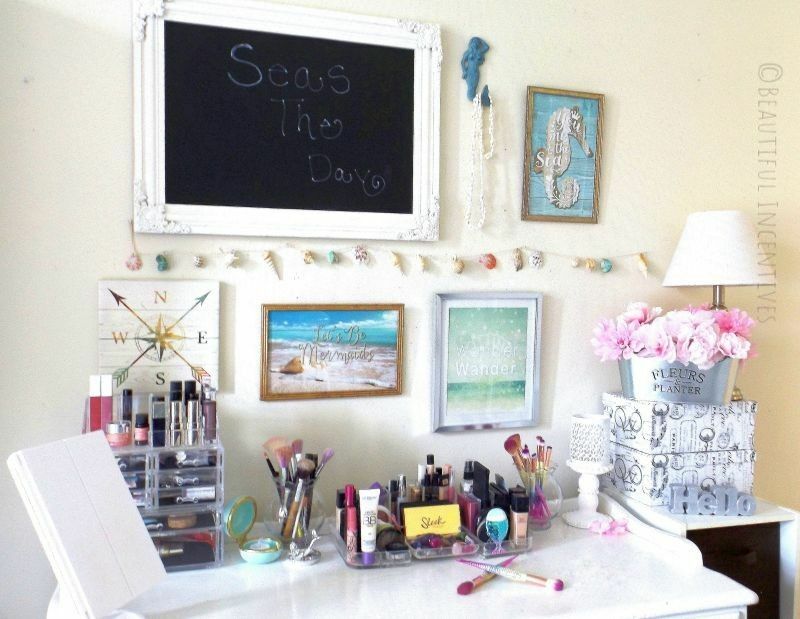 I hope that you enjoyed this Oceanic mermaid makeover for my vanity and that I gave you some useful tips for your own decor! Be sure to check multiple dollar trees to find what you're looking for. They all carry different things and the scavenger hunt is fun and worth it in the end when you get your hands on what you want! Good Luck!